CAMS Australian Rally Championship control tyre supplier, MRF Tyres, has been confirmed as partner of the Australian Production Car Series from 2019. The five-year deal sees MRF Tyres as title sponsor for the circuit racing series, which will commence in March 2019. The category will visit venues such as Sydney Motorsport Park, Phillip Island, Queensland Raceway, Sandown and The Bend. The Production Car Series expands MRF Tyre’s control tyre portfolio, with involvement in various CAMS State Rally Championships and the Australian Rally Championship. MRF Tyres are no stranger to circuit racing, with touring car and open-wheel racing experience across the world. 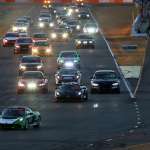 Other initiatives will also include a Pole Position Award, junior driver fund, and a category promotion fund to further boost the profile of the series across the coming years. Dedicated MRF Tyre technicians and a coordinator will also be provided for at-event support. The 2018 series will come to a close at the Phillip Island 6 Hour this weekend, with MRF Tyres to conduct a separate race simulation to gather further data ahead of their 2019 partnership with the category.